Let's play Mad Libs! "___ [name of pop singer who seems like he ironically wears a lot of gas station attendant shirts] to produce ___ - era [decade between the '80s and the aughts] sitcom about his childhood for ___ [failing network]. ___-writer [Fox cartoon about the Griffin family] signed on to pen pilot." If you got "Adam Levine to produce '90s- era sitcom about his childhood for NBC. Family Guy writer signed on to pen pilot," then guess what? Your Mad Lib IS COMING TRUE. 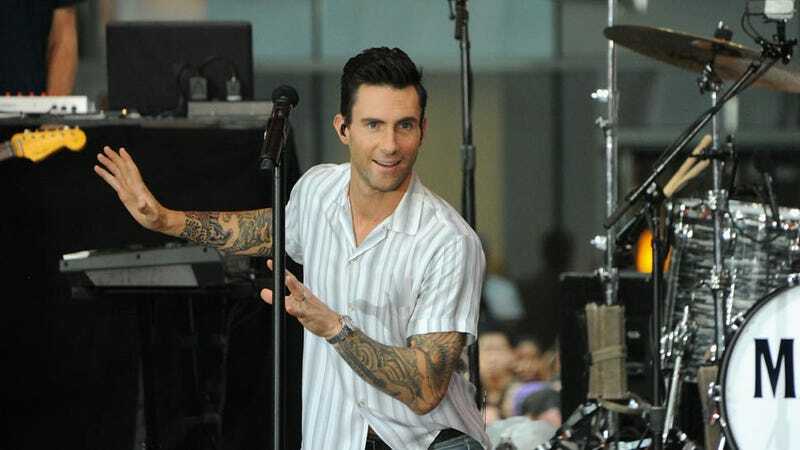 Adam Levine will be producing a '90s era sitcom for NBC called Kids in America. It will be about a small town boy (from Los Angeles) with dreams of making it big in music. The single-camera project, which has received a script commitment, hails from Levine's 222 Prods. and Universal TV where the company has a first-look deal. It is inspired by Levine's real-life experiences and centers on an unconventional family as seen through the eyes of a teenager with the dream of becoming a rock star. Aaron Blitzstein (Family Guy) will write the script and will executive produce with 222 Prods.' Levine, longtime manager/producing partner Jordan Feldstein and development executive Josh Gummersall. Having already accomplished so much in music, Levine is now setting out to ruin comedy, as well. What a renaissance man.